Neither Pencil Pine Falls nor Knyvet Falls were waterfalls that we expected to visit prior to our visit to Cradle Mountain National Park. It wasn’t until we noticed some maps in the visitor centre that we realized how close they were to where we were staying within the park (at the Cradle Mountain Lodge). 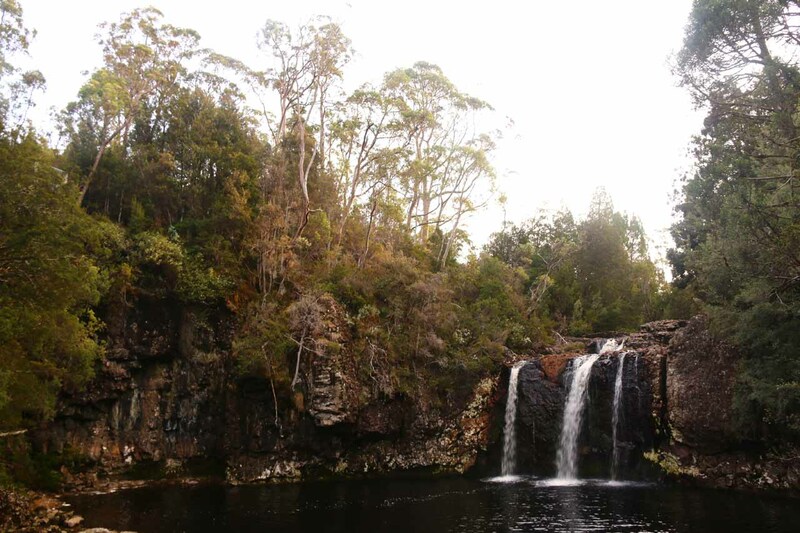 And since it only required a 1.2km return walk to visit these falls, it made sense to pursue them. 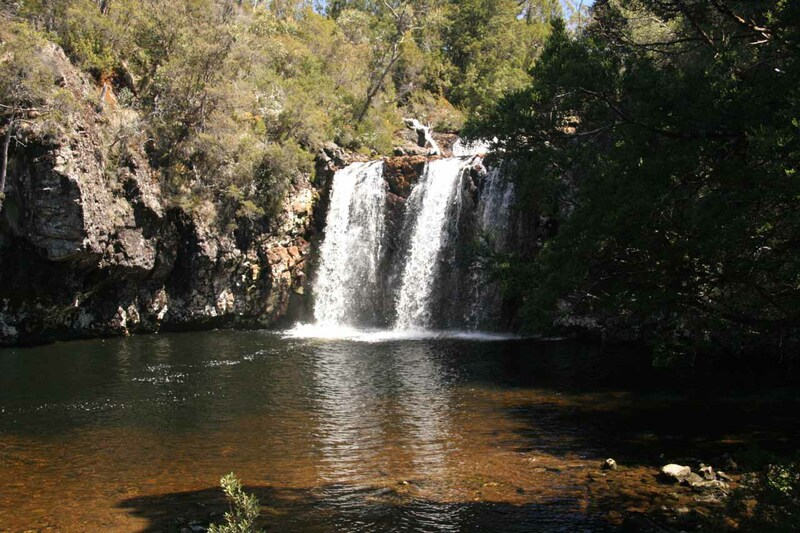 Pencil Pine Falls was a modest 10m waterfall that had segmented into at least two strands each time we saw it. 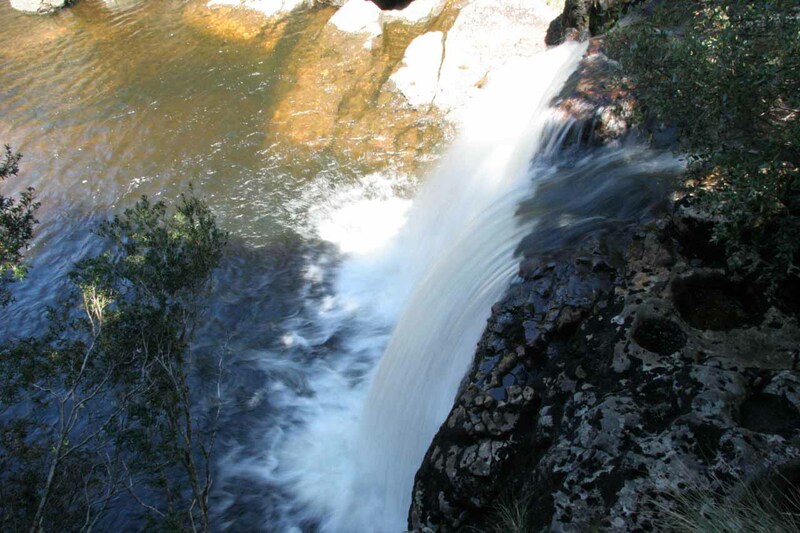 Knyvet Falls, which was also on the Pencil Pine Creek, exhibited a similar characteristic though that one was a little harder to see properly. 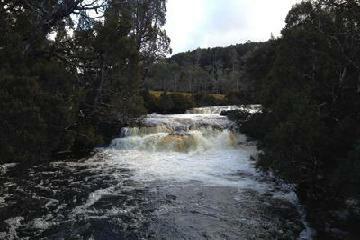 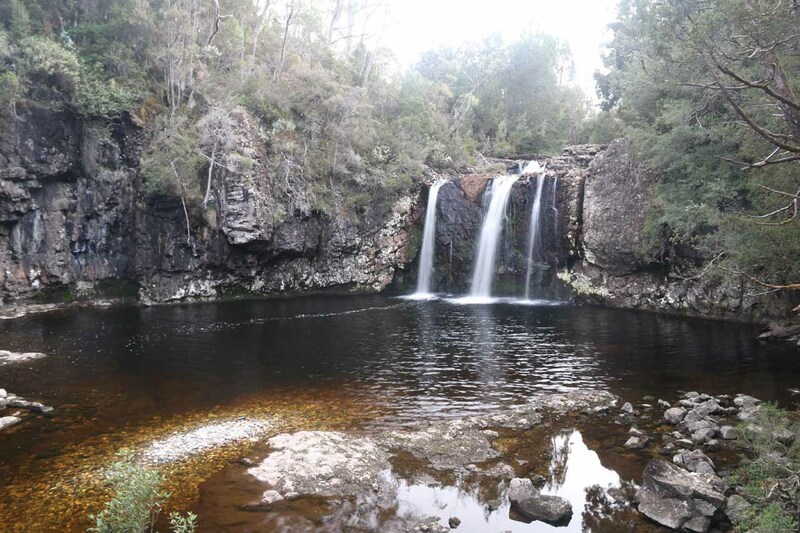 There was yet a third waterfall on Pencil Pine Creek back by the lodge right at the start of the Enchanted Walk. 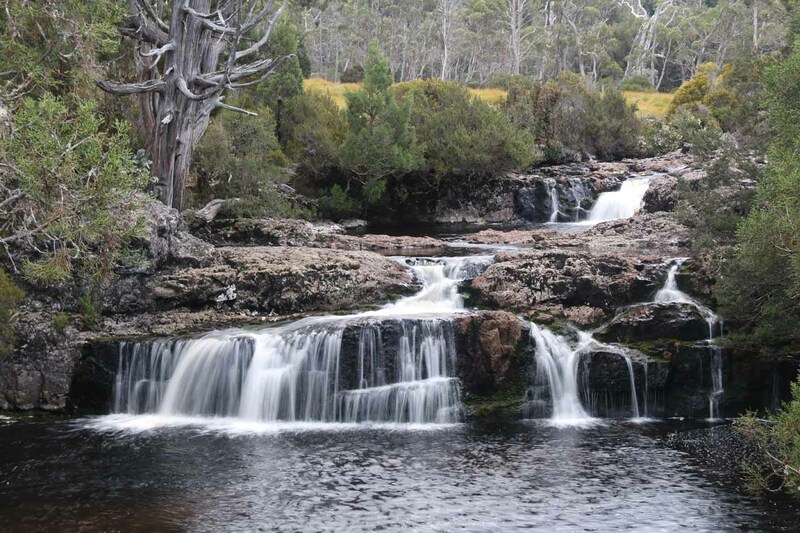 That last waterfall (formally called the Pencil Pine Cascades) exhibited a pleasing cascading characteristic that was very photogenic as it lent itself to long exposure shots with the aid of a tripod or the bridge railing. 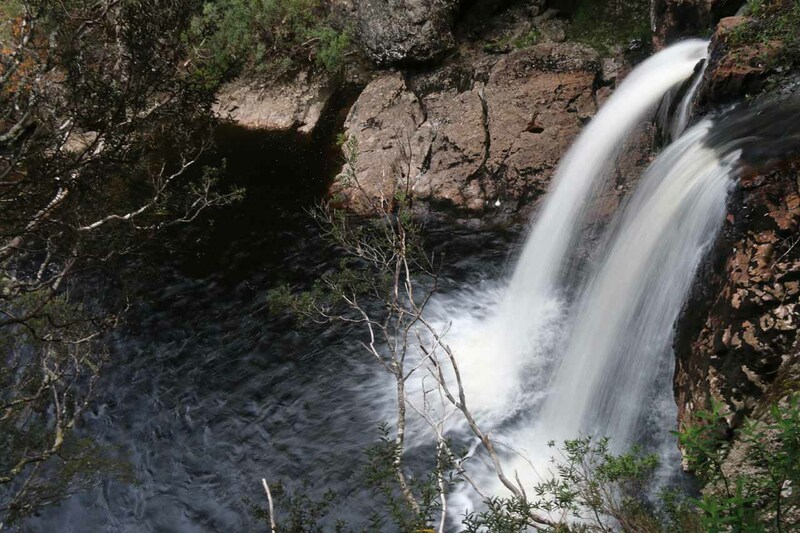 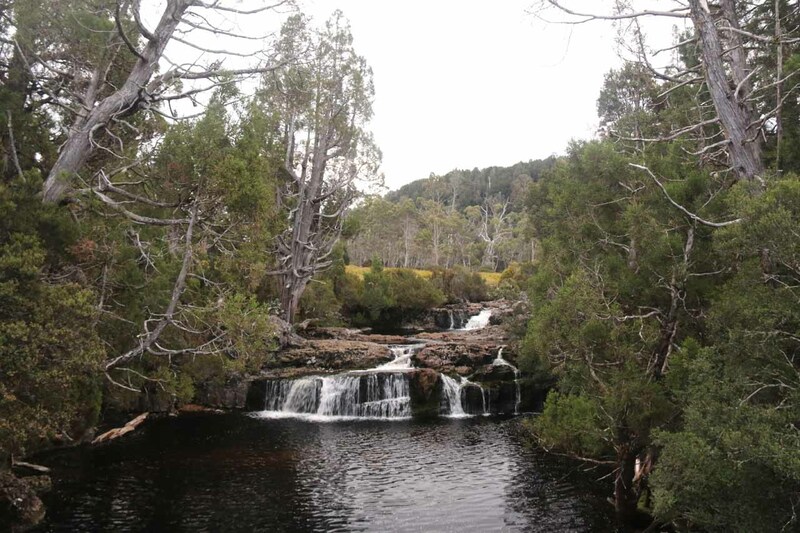 For the track taking in the Pencil Pine Falls and Knyvet Falls, it began almost opposite the Cradle Mountain Shop and car park just down the hill from the Cradle Mountain Lodge reception area. 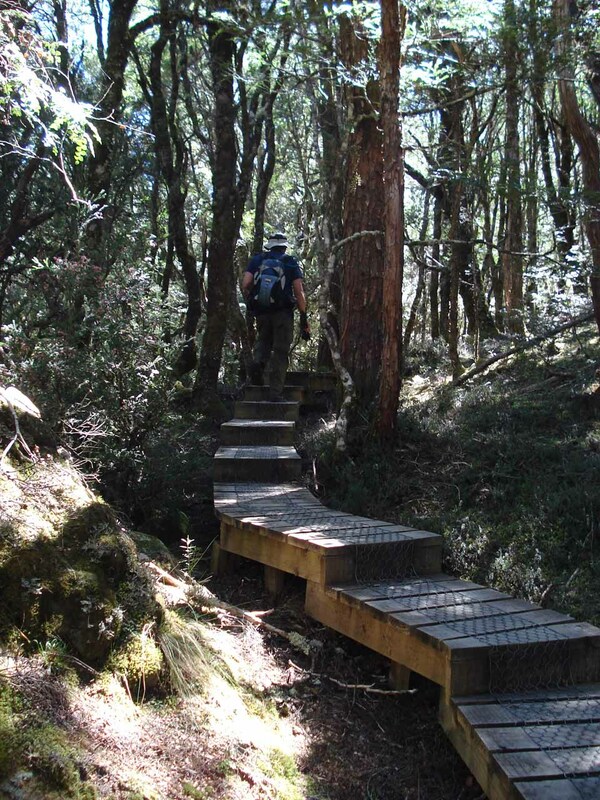 The track was pretty much almost entirely on boardwalk or sturdy composite mesh as it passed through a small patch of buttongrass before descending steps to a junction. 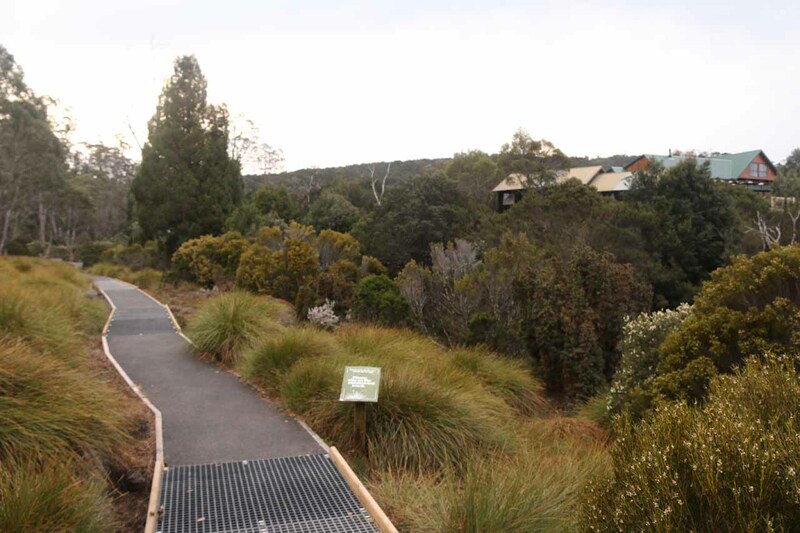 Turning right at this junction, the boardwalk then meandered upstream towards the lookout neighboured by tall trees with the direct view of Pencil Pine Falls that you see pictured at the top of this page. 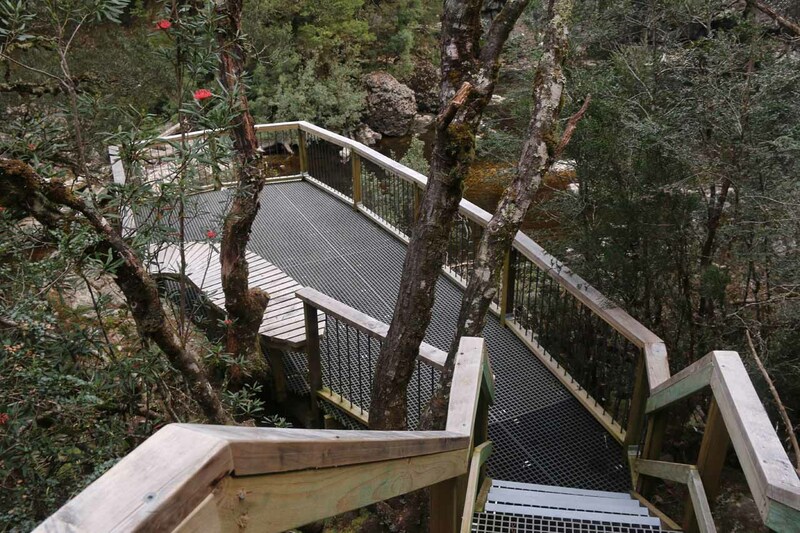 After having our fill of the falls, we then backtracked to the junction and continued to descend on the boardwalk path through native forest. 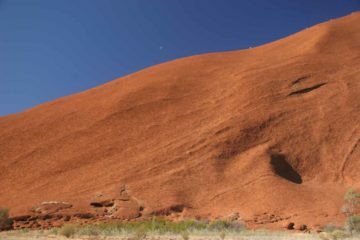 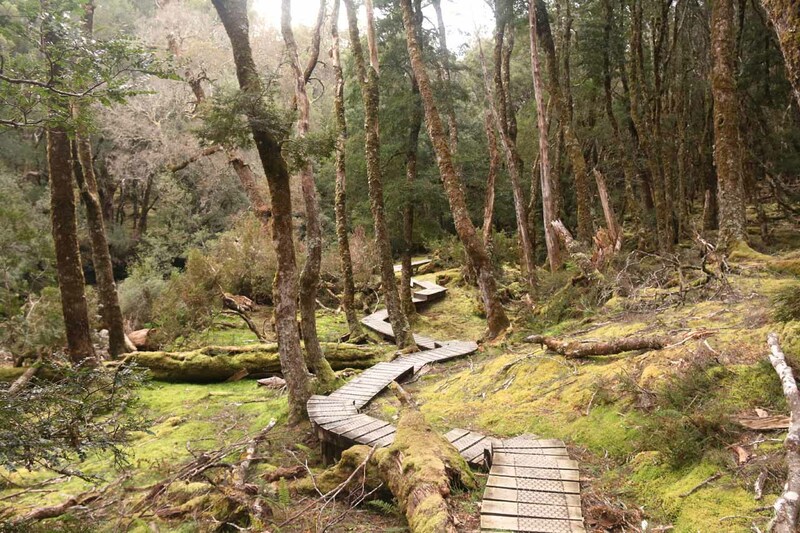 Throughout the walk, the path meandered alongside the dark tannin-coloured Pencil Pine Creek as the scenery alternated between thick forest and pockets of patchy grass clearings. 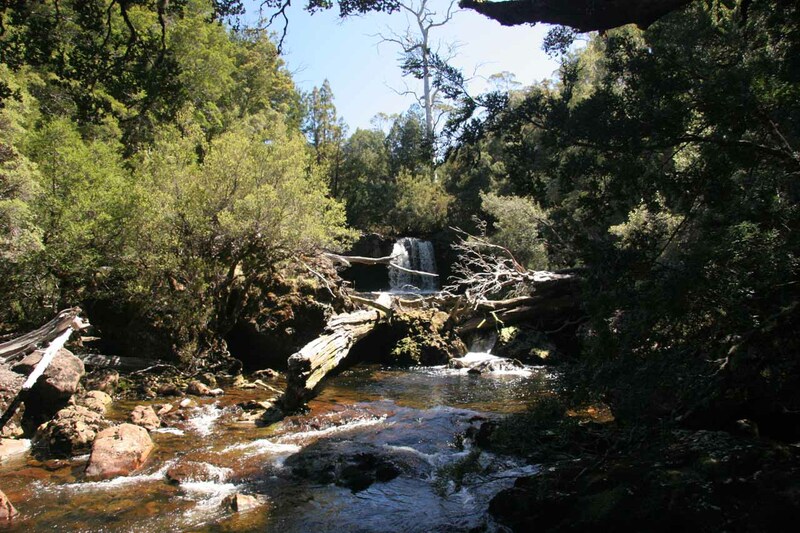 Eventually, the track undulated and descended towards the signposted lookout right at the top of Knyvet Falls. 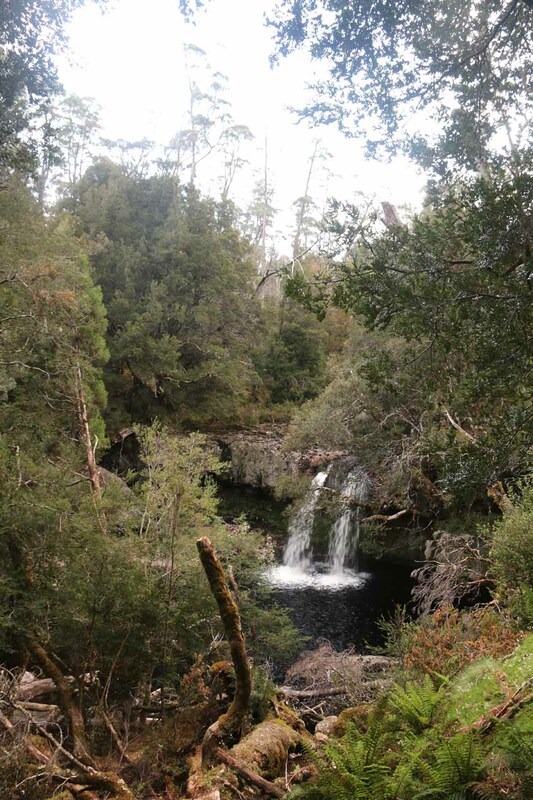 While this view left a lot to be desired, I did manage to continue the hike a short distance further to earn a slightly better and more direct (albeit partially overgrown) view of Knyvet Falls. 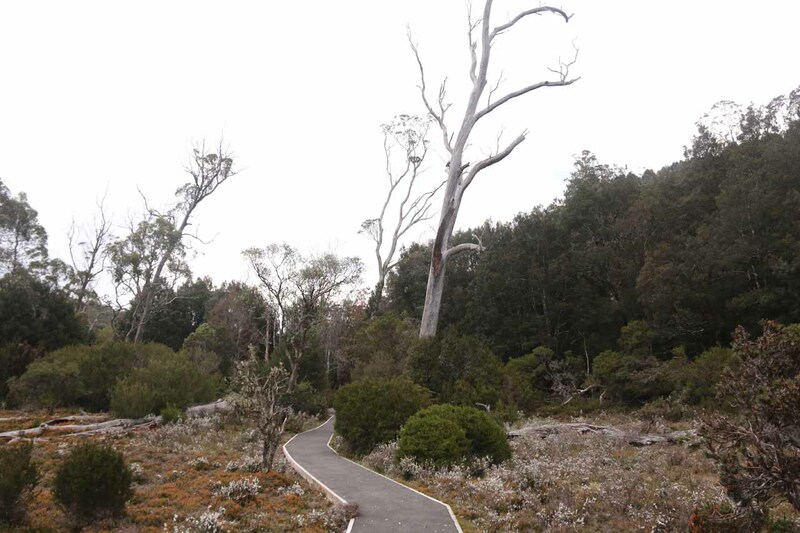 This was the turnaround point of this short track, and it only took about 45-50 minutes though a good chunk of that time was for taking photos as opposed to physical exertion. 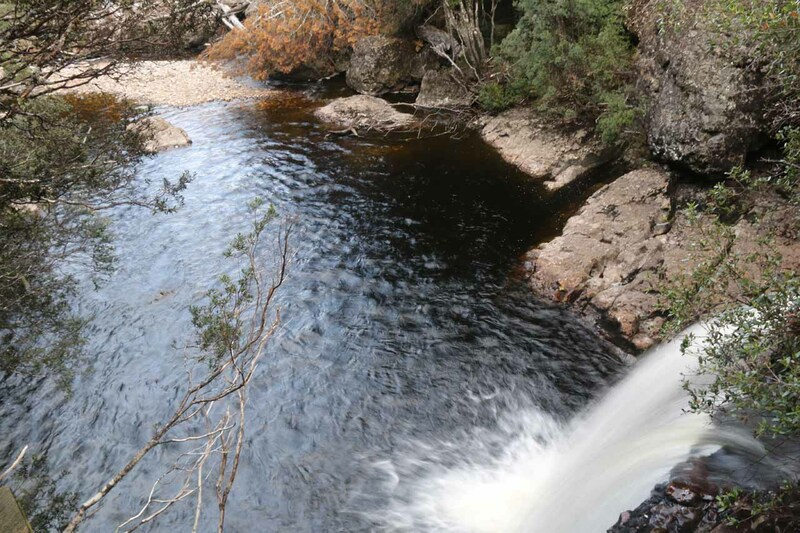 It was only 10-20 minutes return for just the Pencil Pine Falls. 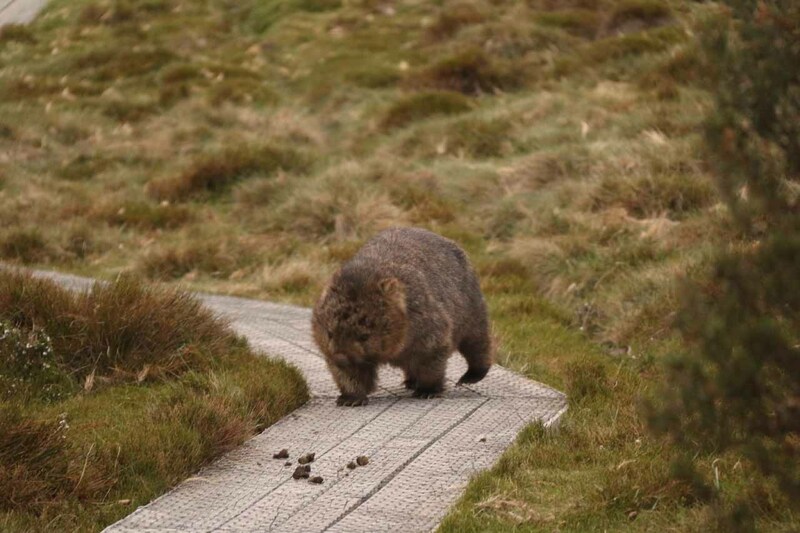 When I returned to the buttongrass patch by the trailhead, I managed to spot more wombats grazing alongside and crossing the boardwalk. 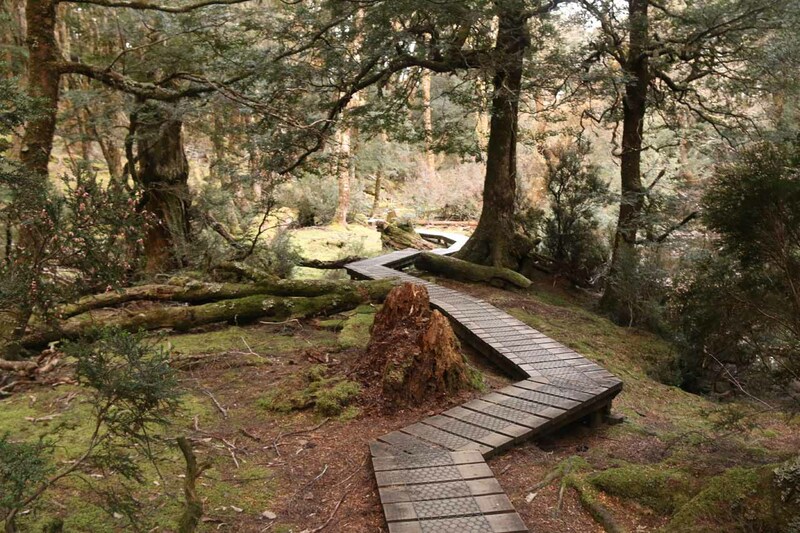 Then, I took some additional time to walk briefly south along the Cradle Mountain Road to the road bridge right at the start of the Enchanted Walk (almost adjacent to the driving entrance to the reception area of the Cradle Mountain Lodge). 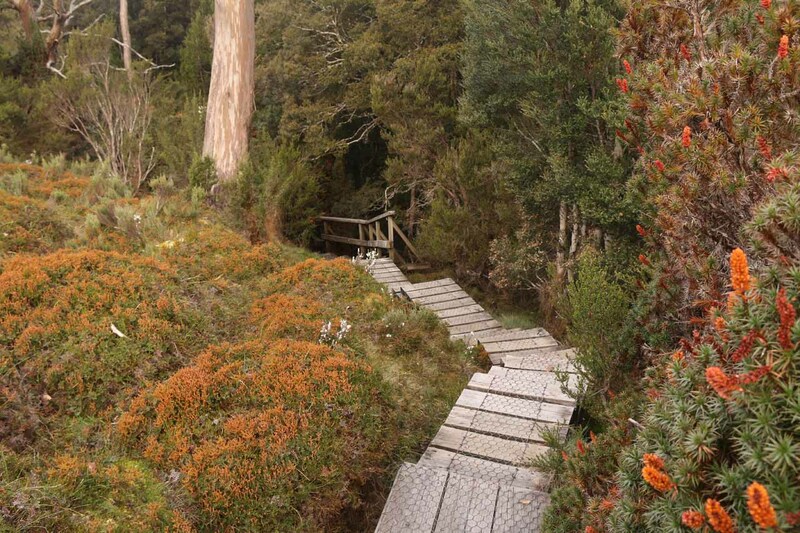 This bridge was where I looked upstream at the attractive Pencil Pine Cascades. 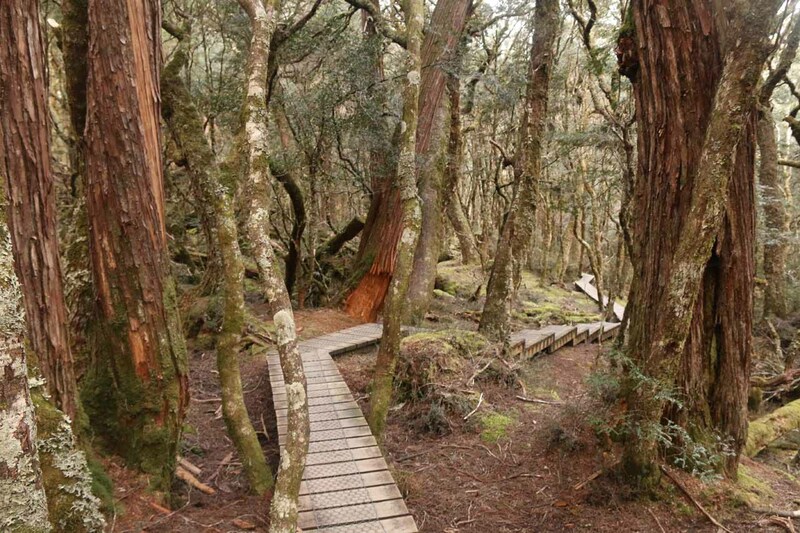 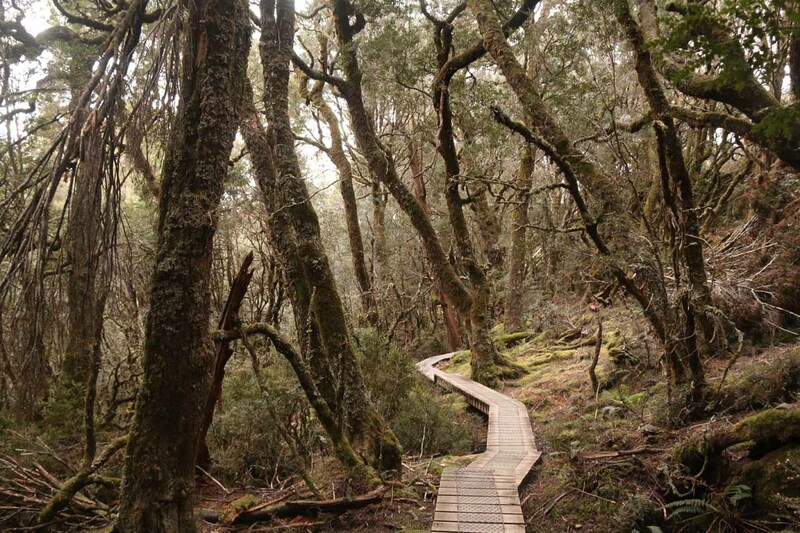 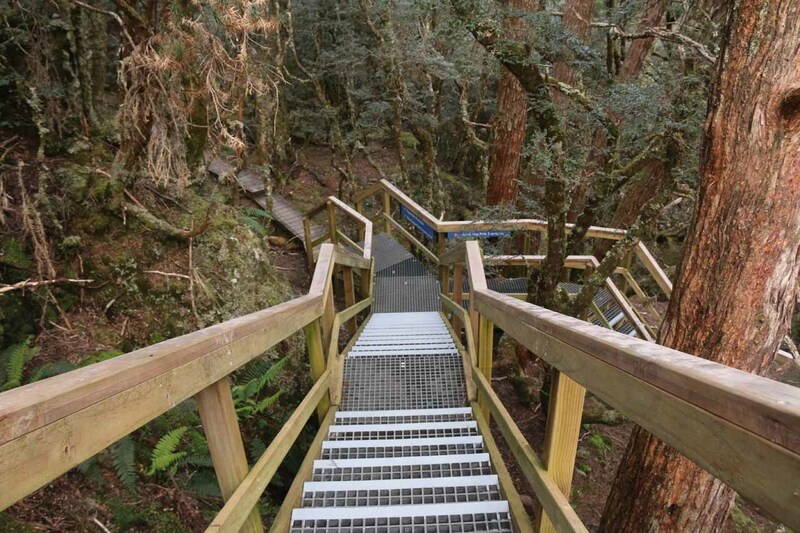 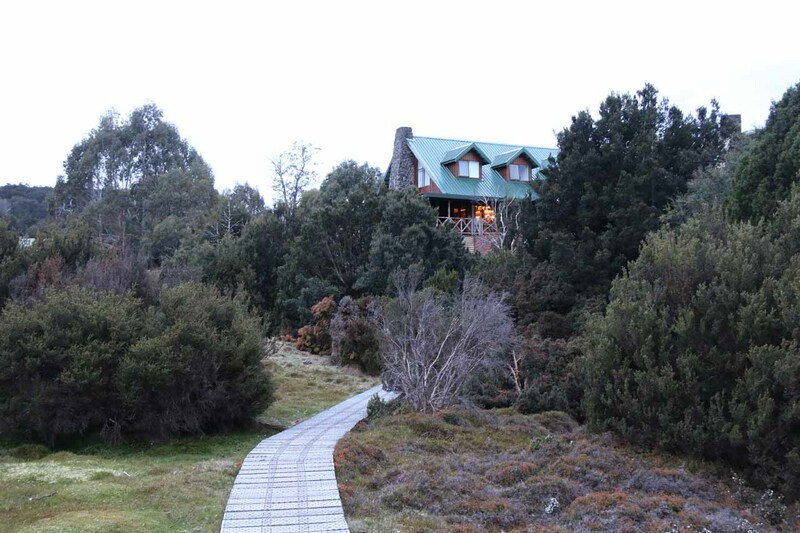 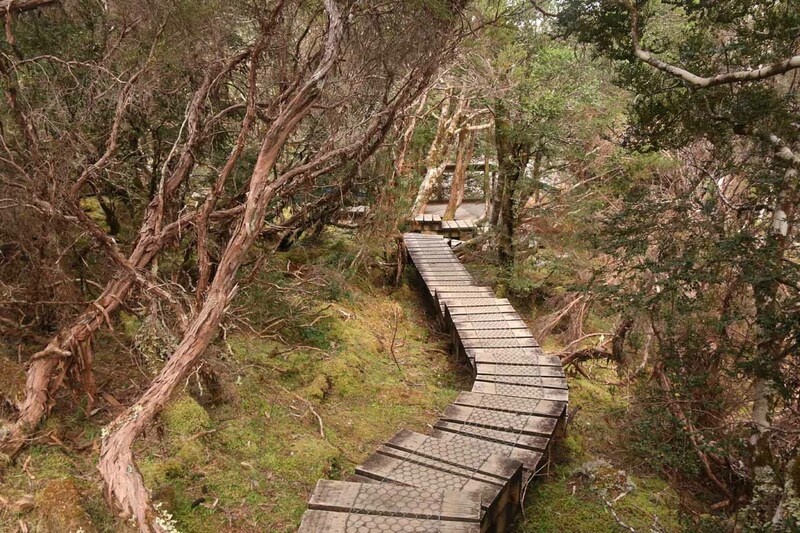 I then embarked on an optional looping nature walk that began and ended at the Cradle Mountain Lodge. 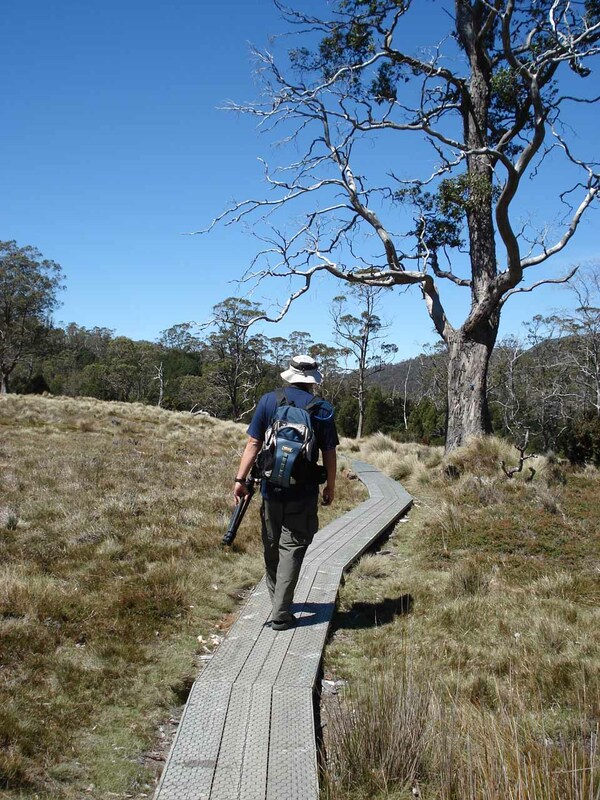 I did this walk in a clockwise direction that started off along the southern bank of Pencil Pine Creek in an semi-open myrtle and pencil pine forest. 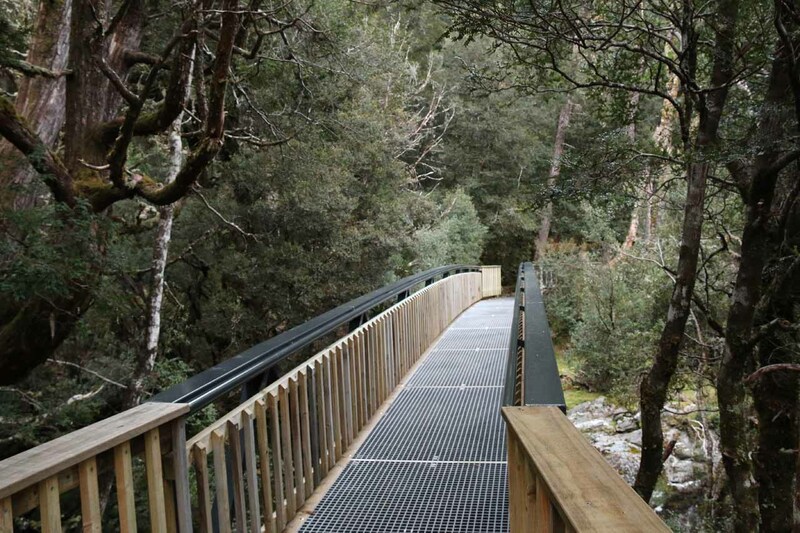 The wheelchair-accessible path passed by some interesting corrugated tin-tunnels (probably meant for kids) before the track veered right onto a bridge spanning Pencil Pine Creek. 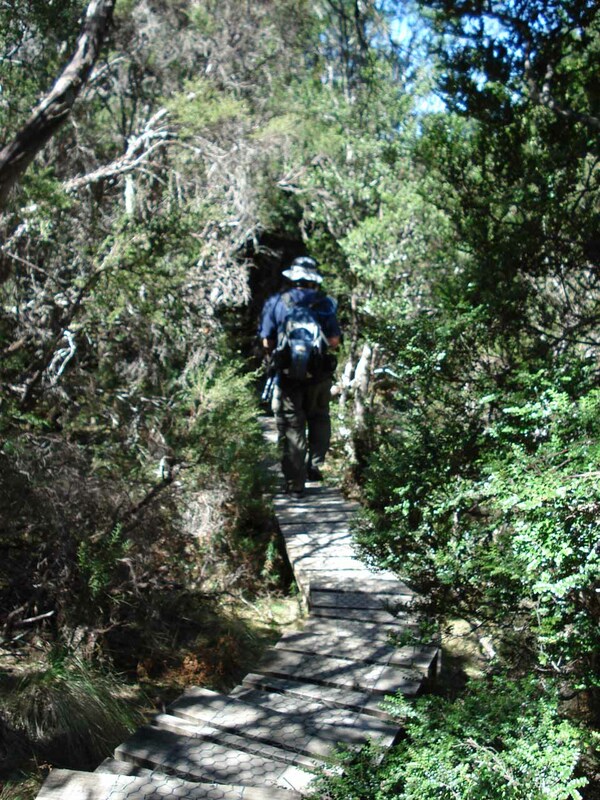 On the other side of the bridge, the track then looped back towards the lodge as the terrain was much more lush and dense than earlier on in this walk. 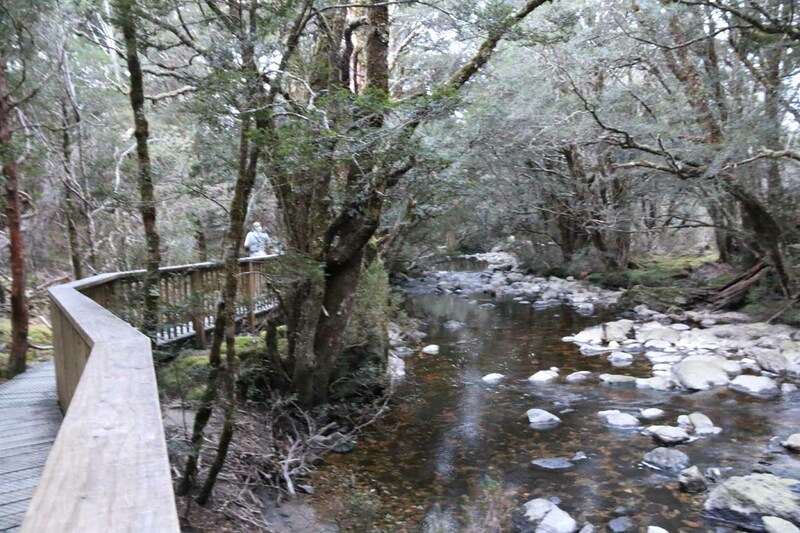 It was in this stretch of boardwalk that (with the aid of a trio of folks here) I happened to spot an elusive platypus in the creek during a post-dinner evening stroll. 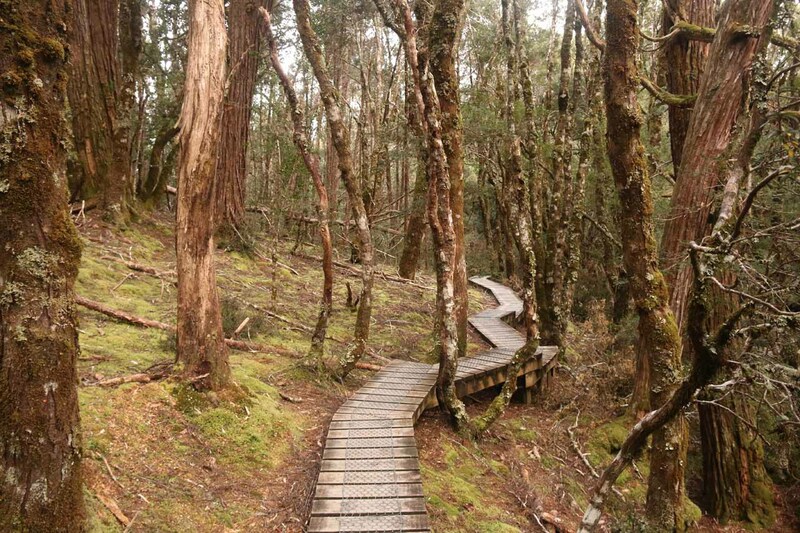 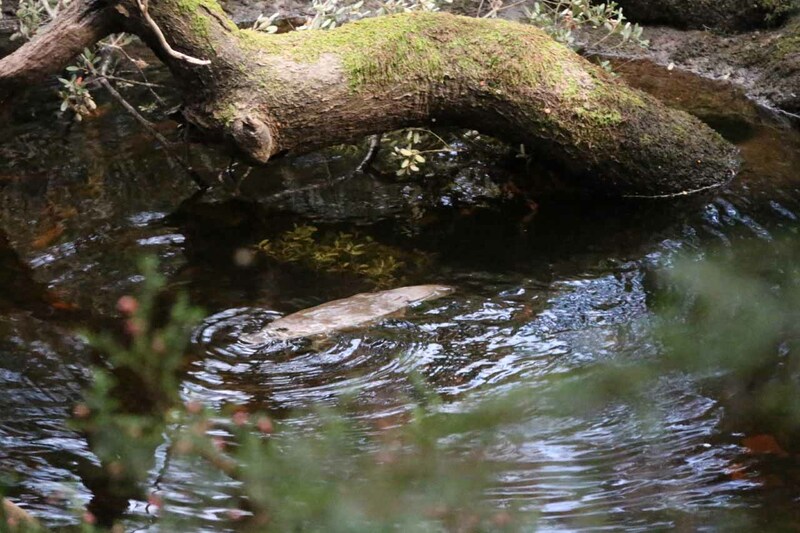 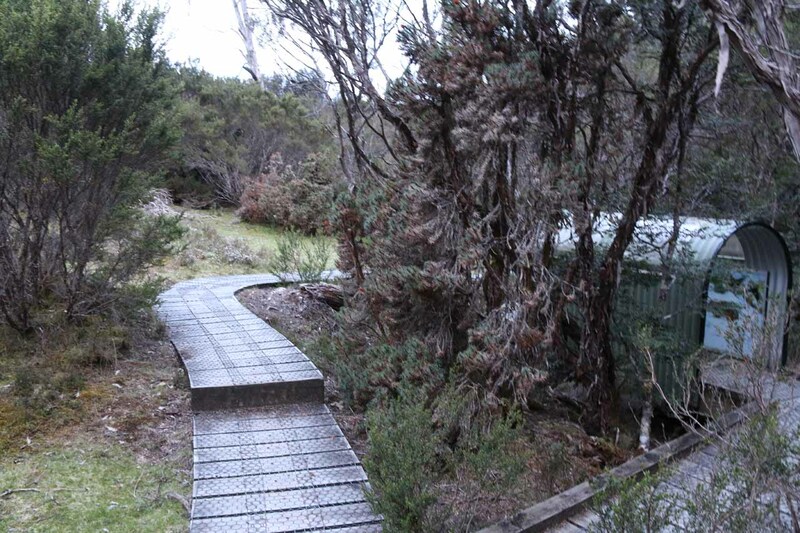 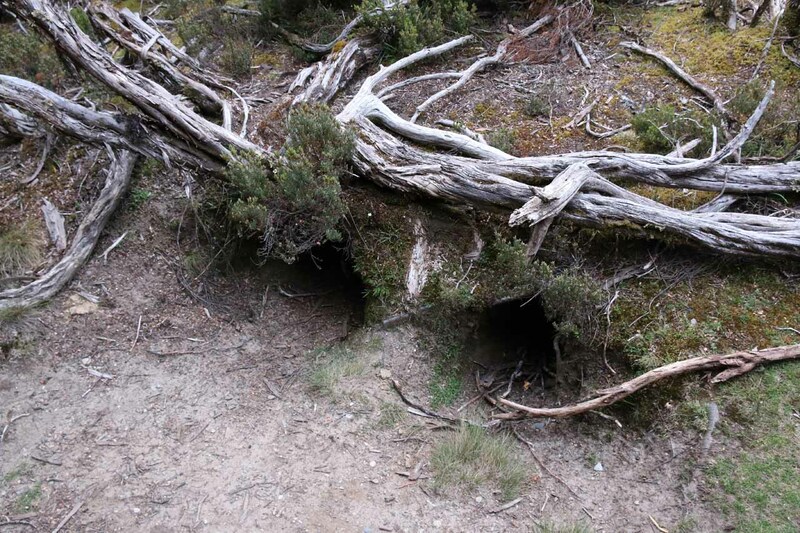 The boardwalk continued to meander alongside Pencil Pine Creek passing by more corrugated tin tunnels as well as some burroughs for wombats and Tasmanian Devils. 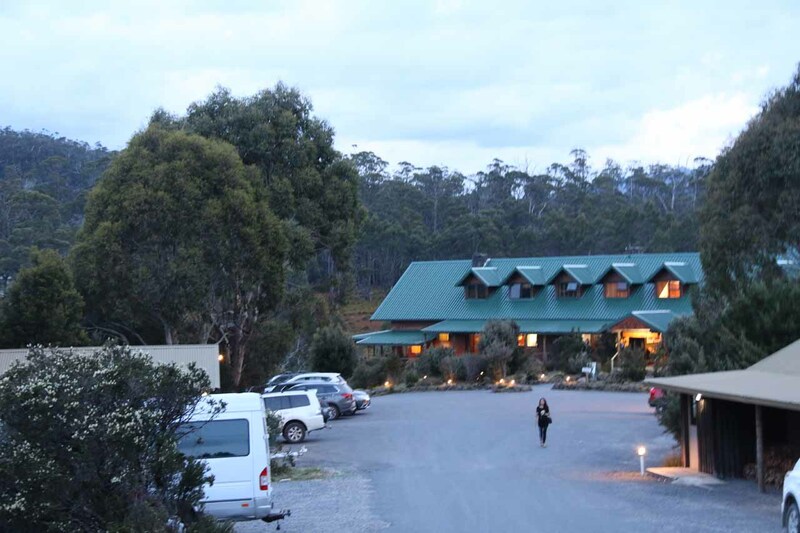 The kilometre walk rejoined “civilization” at the reception area of the Cradle Mountain Lodge, where I could walk back down the driveway to the Cradle Mountain Rd, or walk back to the room since we were staying here in each of our visits. 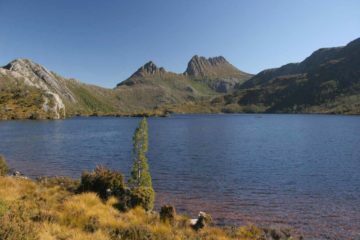 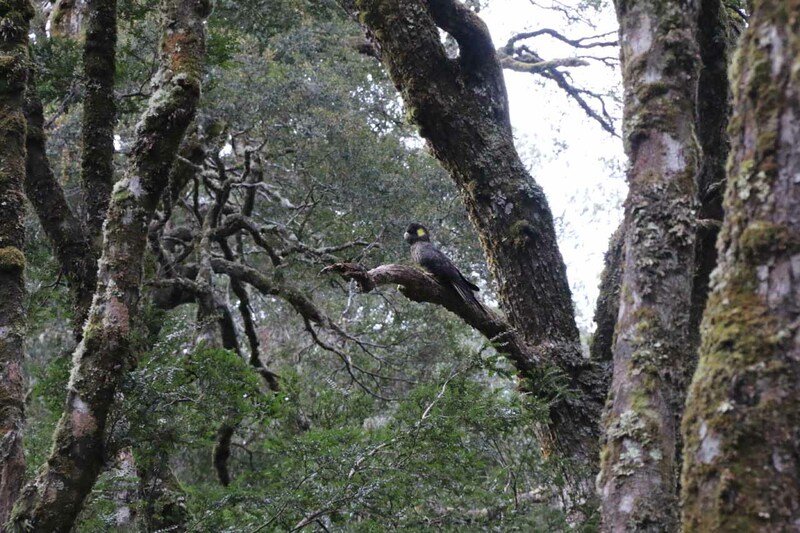 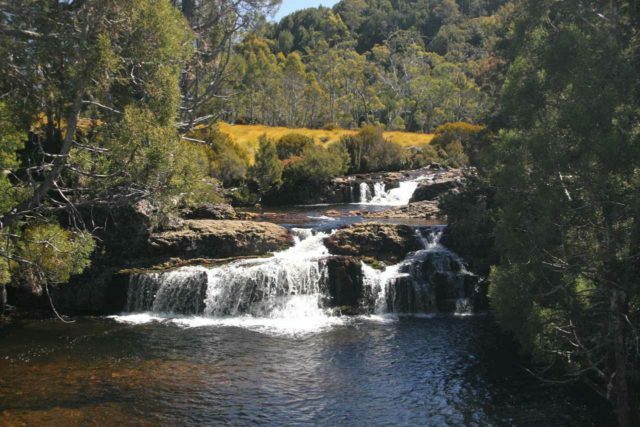 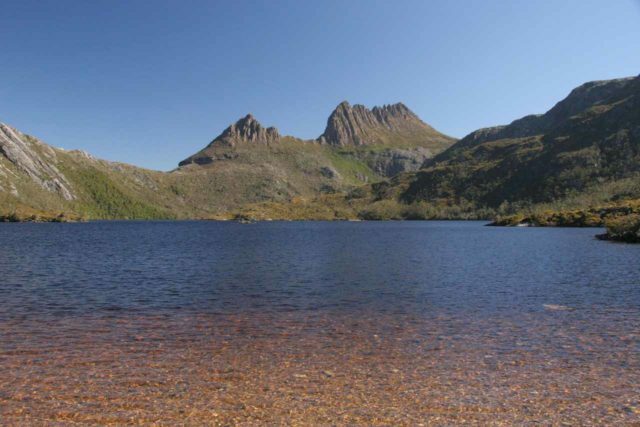 For all intents and purposes, the trailheads of both the Pencil Pine Falls / Knyvet Falls Track as well as the Enchanted Walk were pretty much right by the Cradle Mountain Lodge. 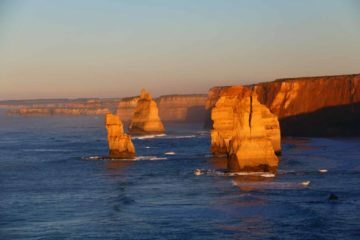 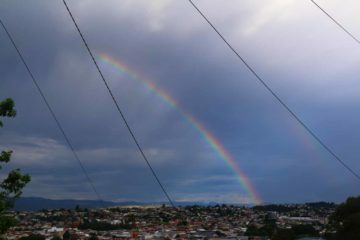 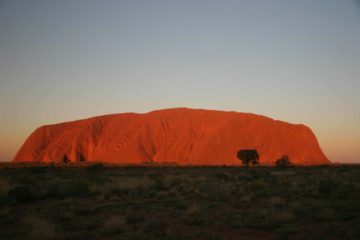 So the driving directions are pretty straightforward from any town in the area with the aid of navigational aids via GPS or iPhone. 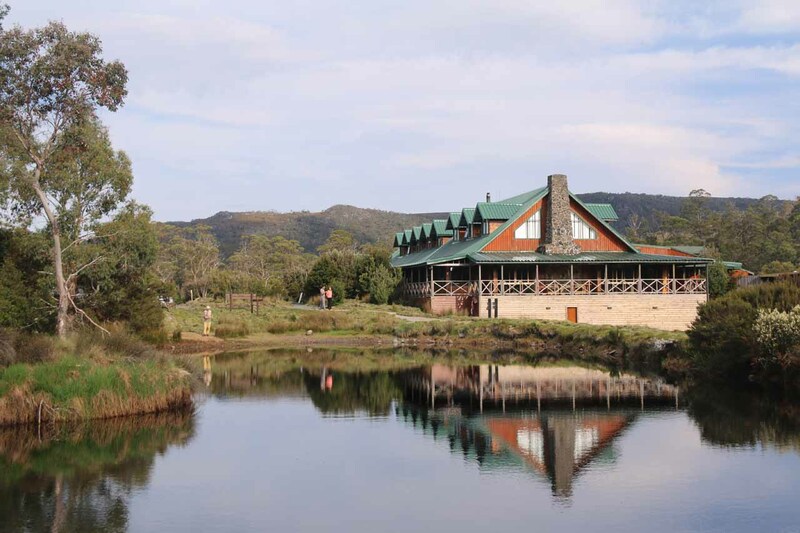 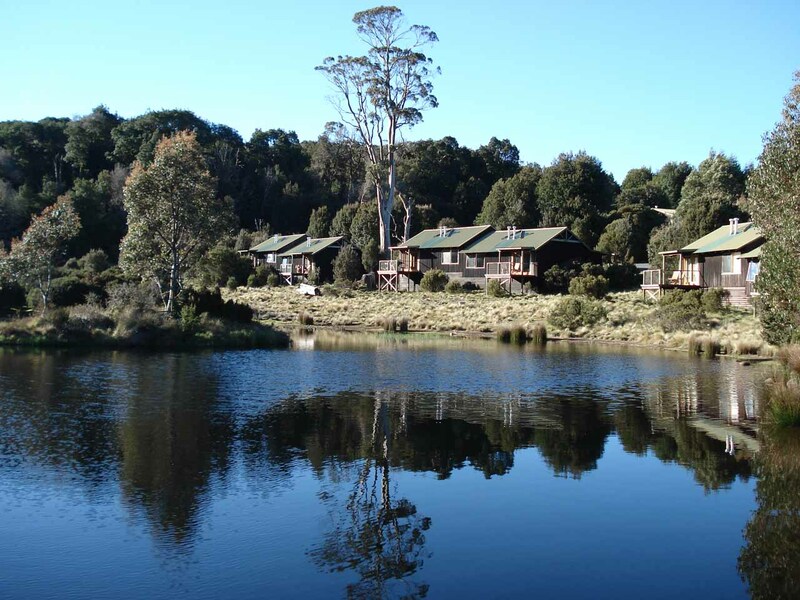 The Cradle Mountain Lodge was merely 5km south of the Cradle Mountain Rd turnoff from Belvoir Rd (C132) or about 1.8km south of the Cradle Mountain Visitor Centre. 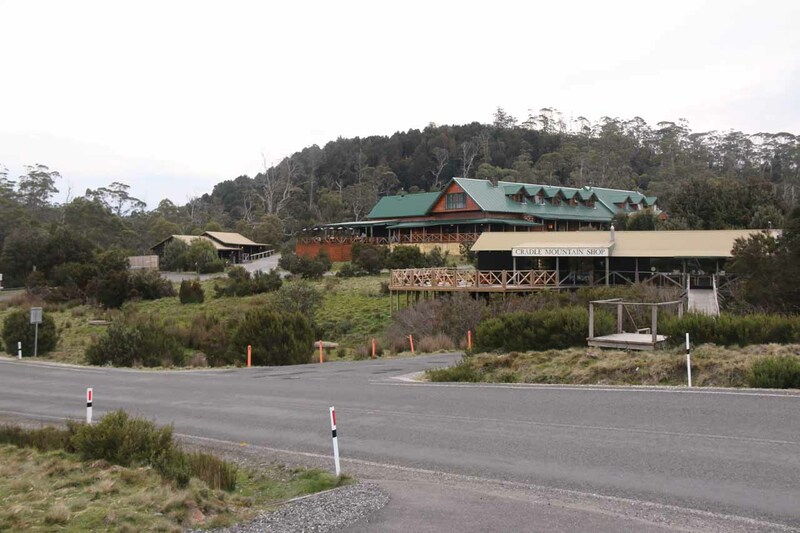 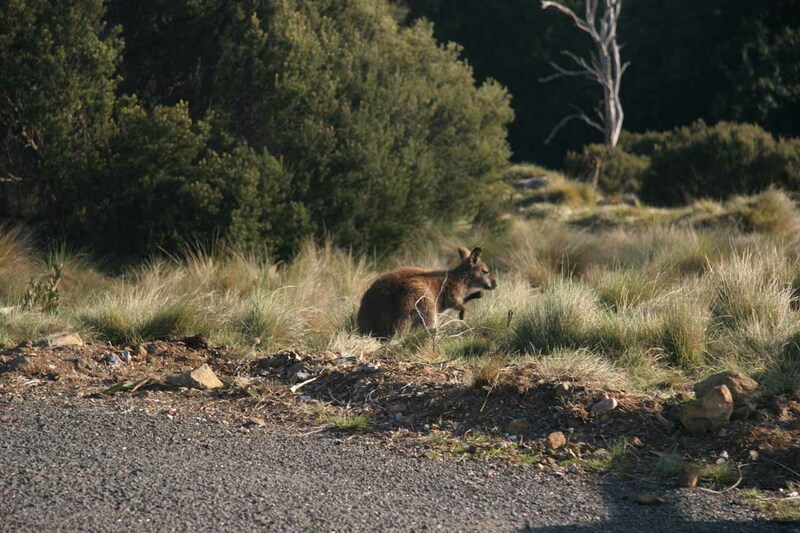 There was parking right across the signed trailhead in front of the Cradle Mountain Shop.